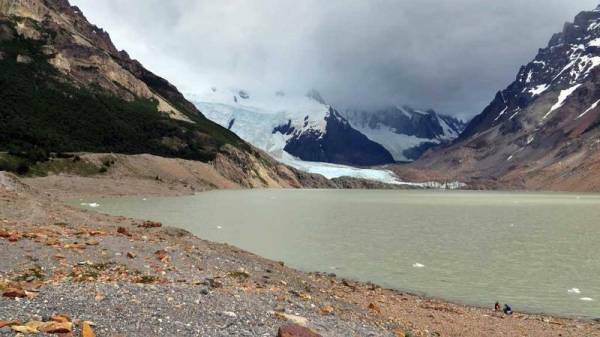 Our Hiking El Chalten adventure started in Buenos Aires, where our G Adventure Group flew to El Calafate. At the airport we met our guide Ayelen and our driver. We immediately headed out across the Patagonian desert. The weather was sunny with high winds, just like you might experience in Alberta or Montana. 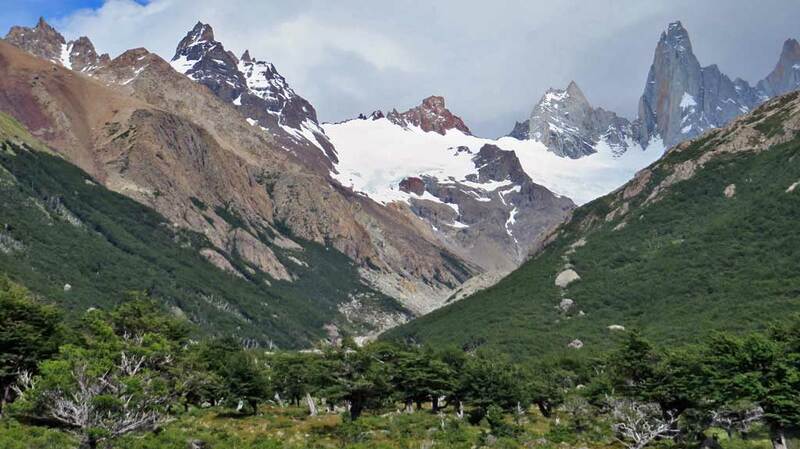 However the large turquoise lakes of glacial meltwater of Lake Argentina made the view distinctively Patagonia. So did the ostrich like rheas and the guanacos along the way. We stopped in the middle of nowhere at a cafe at Hotel La Leona. Butch Cassidy and the Sundance Kid famously visited this small cafe when they moved to Argentina. When we reached the famous viewpoint south of El Chalten, the weather was over cast with light drizzle. 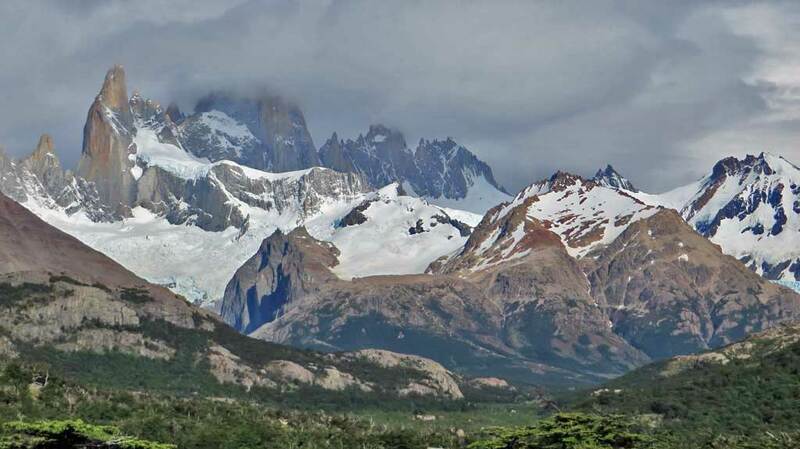 No views of Mount Fitz Roy for us, but we could see the Viedma Glacier in the distance. 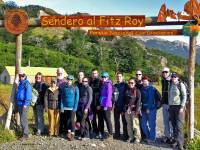 In El Chalten, we settled in to the Hosteria Fitz Roy Inn. Even though it was beginning to rain, Kathryn and I headed out to the Condor Lookout. After about 45 minutes we reached the top of the hill overlooking the village of El Chalten. 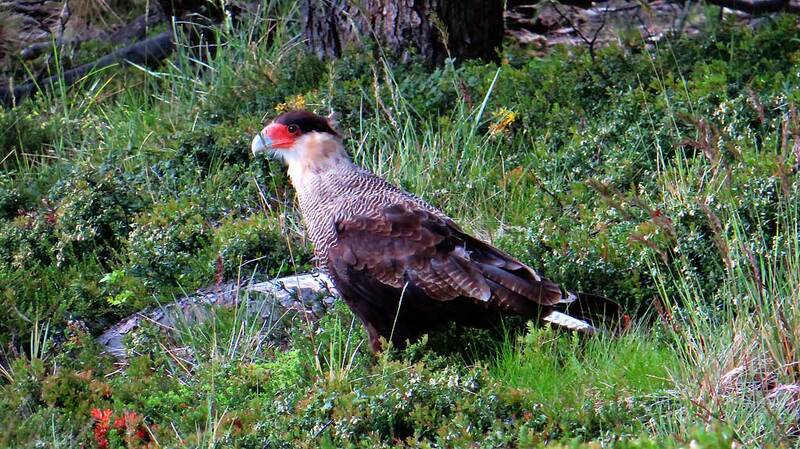 We couldn’t see Mount Fitz Roy or Cerro Torre in the rain, but we did see condors soaring around the lookout. We didn’t hike further to the Eagle Lookout. 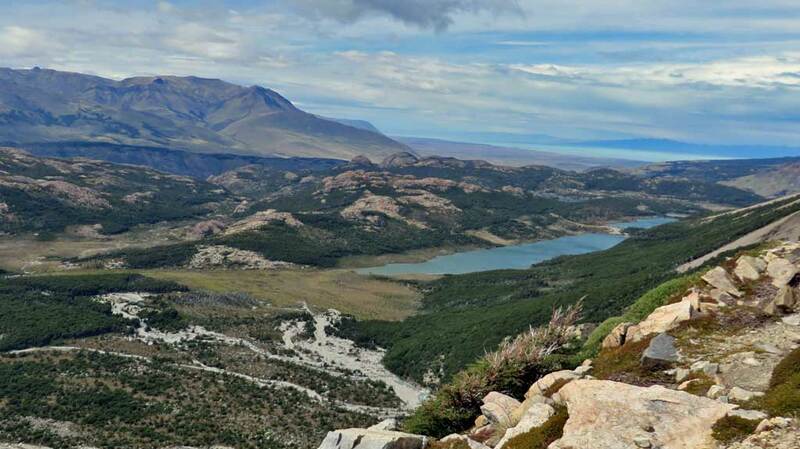 It faces the Patagonian plains and Lake Viedma. 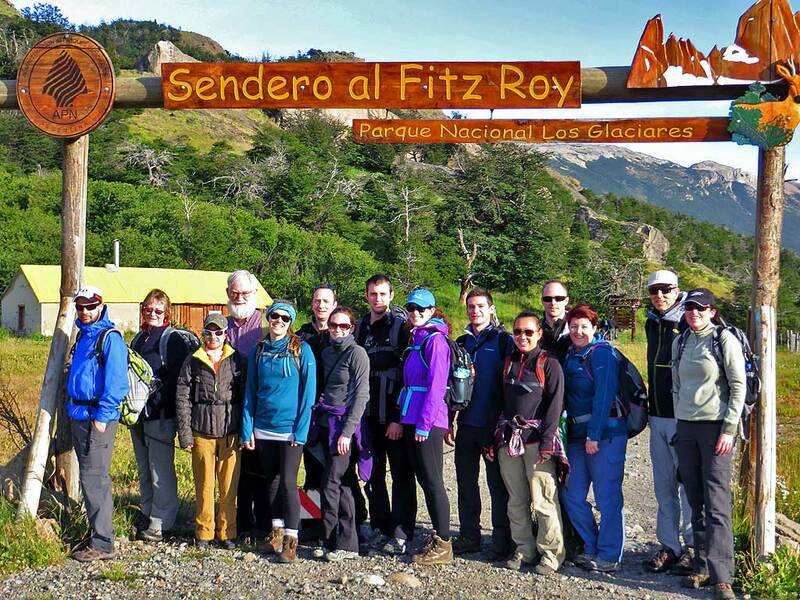 In the morning our G Adventure Group set out Hiking El Chalten on the trek everyone comes here for. The weather was cloudy with lots of sunny breaks. 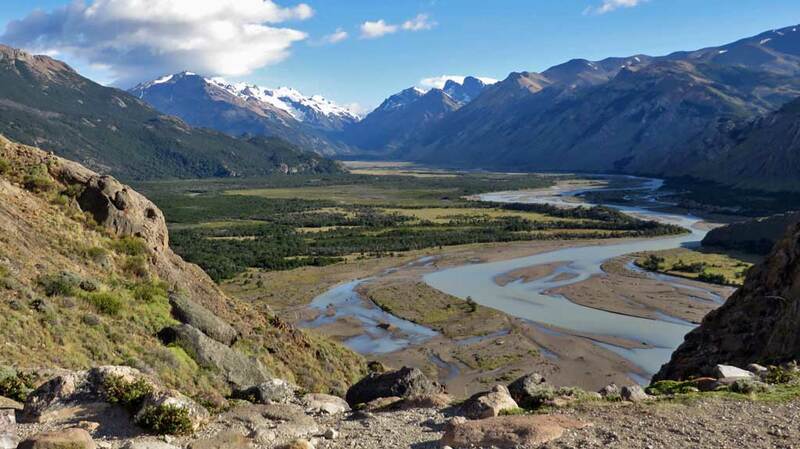 The first part of the trail was a gentle climb with pleasant views back down to the glacial silted river Rio de las Vueltas. 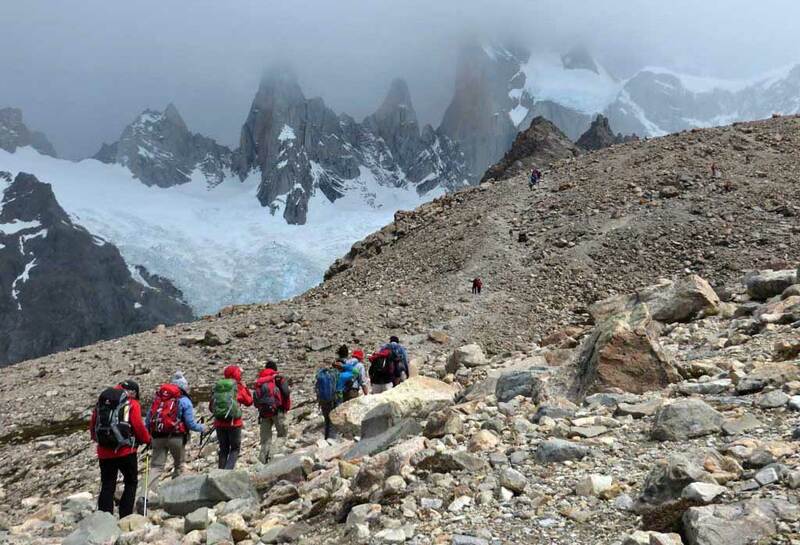 From there the trail was fairly flat until we reached the Mount Fitz Roy viewpoint. Only the bottom half of the mountain was visible. 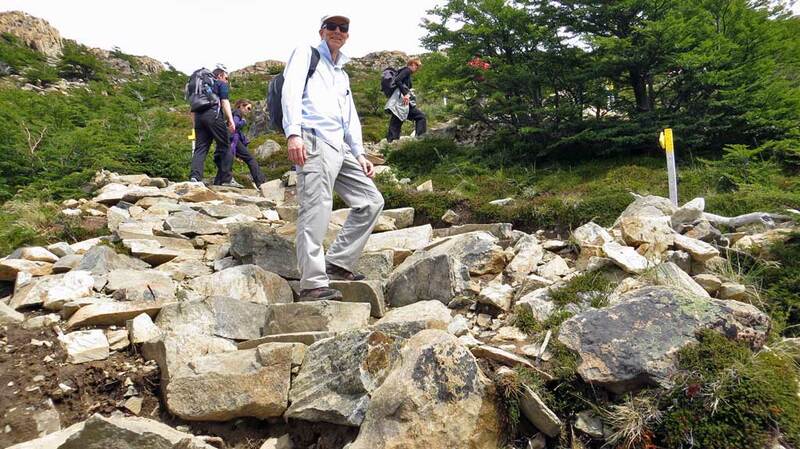 Then, just when you thought the hike was easy, we began the climb up through the rocks and glacial boulders that create the lake called Laguna de los Tres. I struggled on the way up, but was humbled by a German woman in her 70s who was on the way down after finishing the hike. When we reached the lake, the winds were gusting around 40 – 50 miles per hour. The rain turned to driving sleet. Laguna de los Tres was clearly visible, but Mount Fitz Roy was nowhere to be seen. I was worried that Kathryn would get blown right off the mountain and down into Lake Sucia. 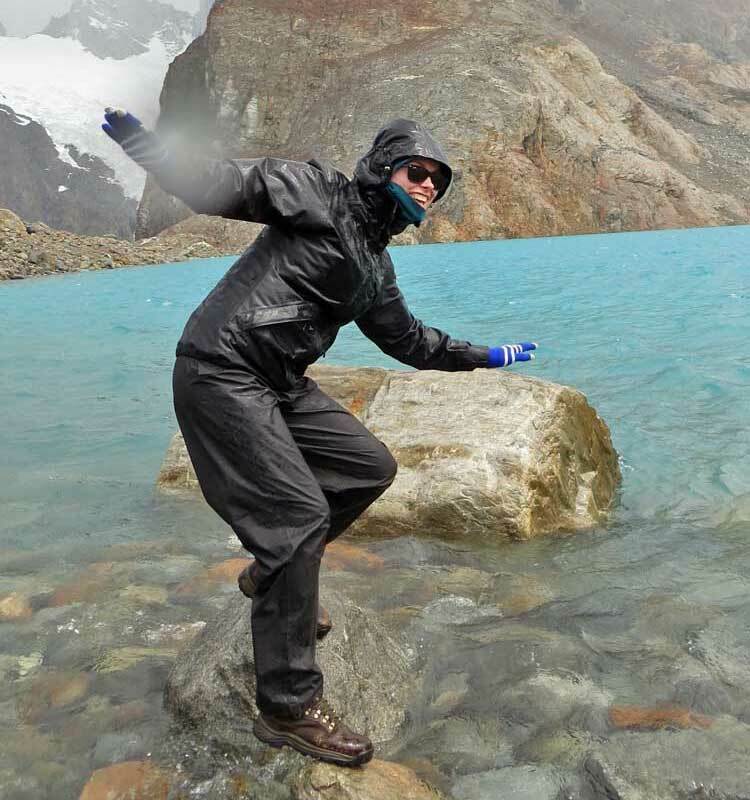 The weather seemed determined to prevent us from being there, but my gortex clothing was allowing me to survive. I put on my sunglasses, so the sleet would bounce off and allow me to see. I crouched down against the wind and freed a KitKat bar from my pack. Bad weather couldn’t get the best of me. It was a great feeling. I don’t think it would have been as much fun on a nice day. 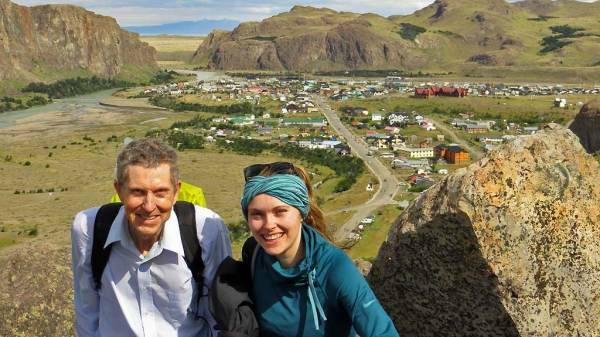 By the time we hiked back down to El Chalten, the weather was warm, calm and sunny again. I learned a valuable lesson about the unpredictable nature of the weather in Patagonia that day. On the next day, we were given options for activities. Kathryn went horse back riding for the first time on a solo trip. She was amazingly confident. She spoke almost no Spanish and the rancher who picked her up spoke almost no English. They rode through his farm lands and he served tea at one of his cabins. When I asked her afterward whether she had a good time, she was so happy that she teared up. 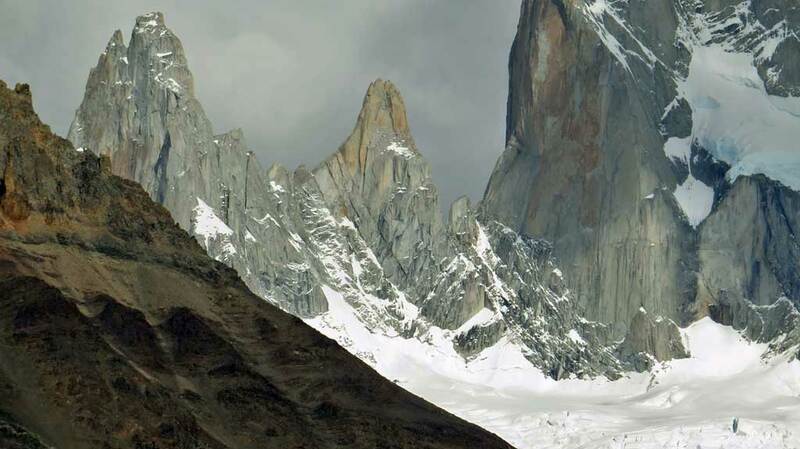 Meanwhile I hiked to Cerro Torre that day. This hike was about half as long as the day before and much more level. 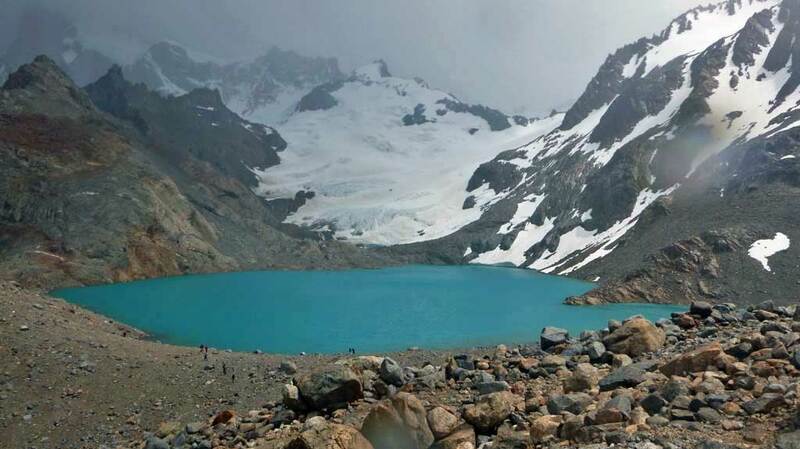 Unfortunately clouds obscured Cerro Torre at the end of the trail, but the lake was clearly visible. There was no dramatic weather like the day before. The people along the route made the hike very pleasant. Spanish greetings were the international language that day. I learned many new ways to say hello beyond the standard “hola” greeting used when you meet another hiker going the other way. Many others in the group chose to tour the Viedma Glacier and walk on its surface. They said it was a good tour. After lunch we drove to El Calafate to reposition for our Perito Moreno Glacier Tour.